Google Places Image Ad in Search Results! Home > Google News > Google AdWords > Google Places Image Ad in Search Results! You thought you would never see it, an image or interactive ad on a Google search results page. But it is here, finally. A search for jason bourne has an ad at the top of the page, with an image, that contains a "Watch the movie trailer" link. 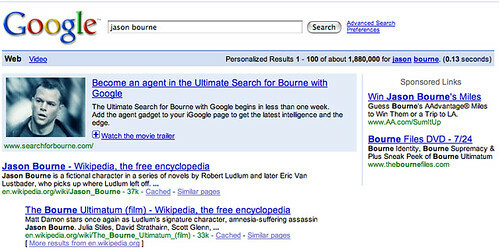 Clicking on the ad takes you to http://www.searchforbourne.com/. Clicking on "watch the movie trailer" shows this video embedded directly in the search results. Marrisa Mayer of Google, did suggest this might happen in the future. But I am still very shocked. Postscript: Google has done something like this in the past, Danny covered it with NBC Scores Graphical Ads/Promos On Google in 2006.